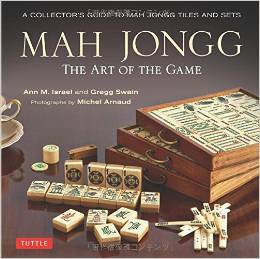 Today was our annual Mah Jongg holiday party. J’s apartment was beautifully decorated for the holidays and we took the time to catch up with one another and talk about everything under the sun before we started playing since we knew that it would be a couple of weeks before we were together again. Of course, presents were opened and there were so many! 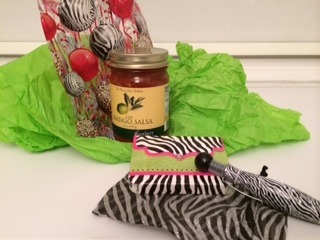 J gave us all a beautiful notepad and pen as well as a yummy lime and mango salsa from Gunther’s in Texas. 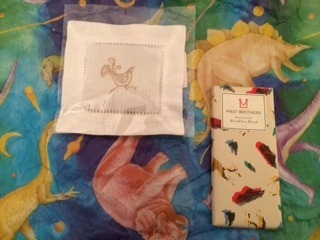 X. gave each of us a beautiful lavender-filled sachet pillow from the Zaanha Fund (funding educational needs for the children of Afgan) and a yummy chocolate bar crafted right there in Brooklyn by Mast Brothers. 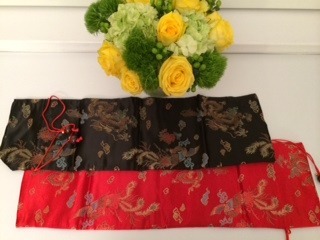 Note the fabulous tissue paper with dragons on it…where in the world did X. find that wonderful paper?!!! S. gave us this darling little flower that sits on top of your tea cup and keeps it warm – I actually don’t know how to explain it but it is terrific. 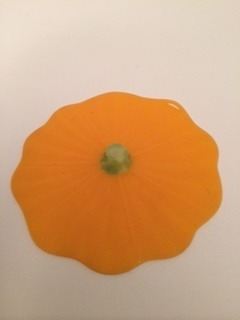 I guess it really looks more like the top of pumpkin in this picture! 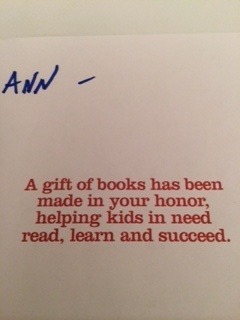 But her best gift was a card to each of us letting us know that a gift of books has been made in our name to the First Book organization which will help kids in need read, learn and succeed. 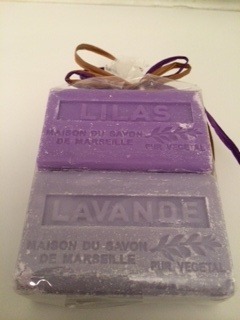 The other S. gave us beautiful bars of lilac and lavender soap from La Savonnerie. K. – with her trademark beautiful gift wrap – gave us wonderful and warm shearling earmuffs by Uggs – perfect for this really cold day. 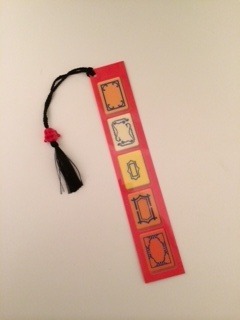 and a bookmark with a dangling Buddha on it from Madame Mahj. 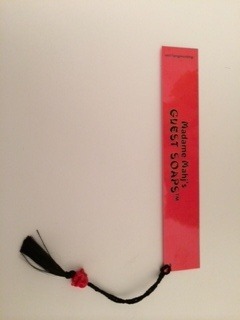 The bookmark is labeled “Madame Mahj’s Guest Soaps” because the picture on it is of different examples of soaps or White Dragons. Very clever, Madame Mahj! 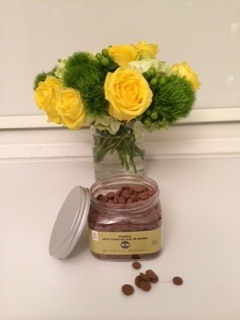 And finally, because I have the most wonderful, caring, loving and supportive friends, I gave each OM a container of the amazing Hot Chocolate & More chocolate bits flavored with the spice called Yemen from Lior Lev Sercarz’s La Boite. Add one or two of these chocolate drops to your hot chocolate or your coffee and suddenly you are smelling the amazing aroma of ginger and cinnamon from the Yemen spice. Or, as K. and I discovered, just eat them out of the jar! 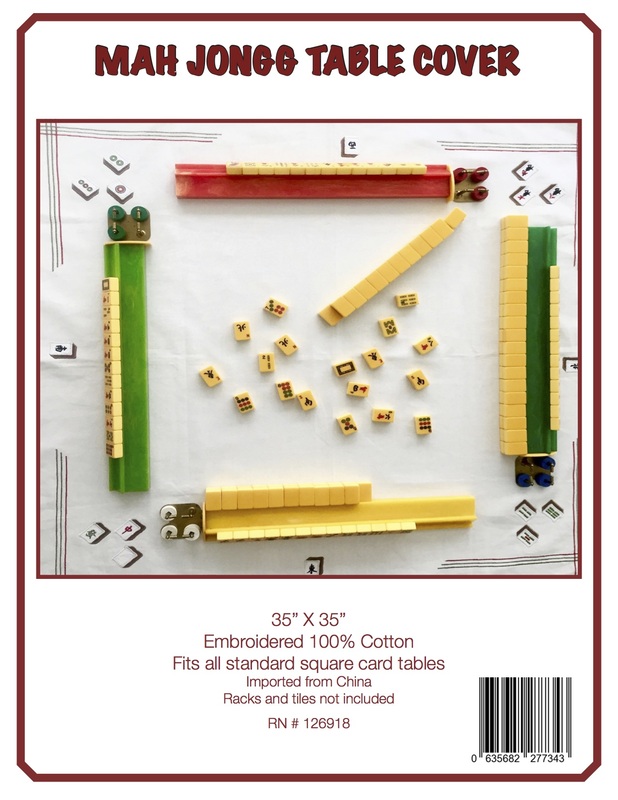 This entry was posted in Uncategorized and tagged apartment, brooklyn, chocolate, Christmas, decorate, decorated, dragon, fabulous, friends, games, gunther, gunther's gourmet, holiday, lavendar, lime, luncheon, mah jong, mah jongg, mahj, mango, mast brothers, paper, present, presents, sachet, salsa, Texas, tissue paper, together, wonderful on December 19, 2013 by Mah Jongg and Me.